Today I went into the city and bought some more coloured beads to finish off the trees. My baubles also got a bit more sophisticated, with the use of fine jewelry hook rings rather than the more chunky wire I used earlier. The tinsel I made by unwinding some glittery cord. 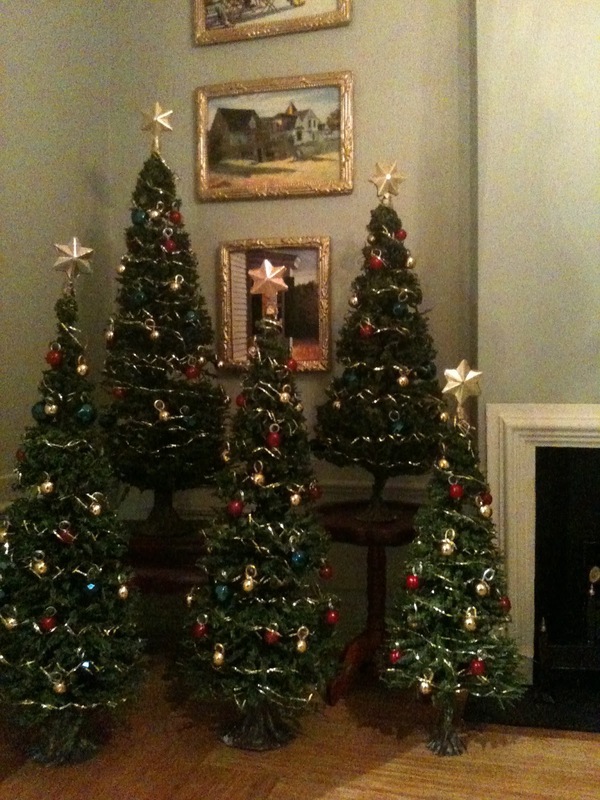 Aah so pretty, they get me all into Christmas-gear :) Lovely to see what you used and how you went about decorating 'm. They are really nice!! Thanks Debora! I LOVE your chairs too, thanks for checking out me post! Your Christmas trees looks wonderful, love your fine tinsel. I've just looked at the calendar - not long to go now, so I'd better start getting prepared! Thank you for your kind comments Jonquil! I am now going to move on to try make a wreath. You have inspired me now! AWSOMENESS! Pure awsomeness. Your trees are wonderful and the picture of the group just amkes me happy. haha thanks Giac! I'm so glad you like them! Are you going to decorate the Manor for the holidays? I would be excited to see it! I finished reading all your posts. I always do a blog if I conquer, before putting it on my list of favorite blogs. I like to know the story behind it. I really like your creativity and will follow with interest the construction of your house. See you soon!